Latest figures from Visit South Devon reveal that 2016 was an exceptional year for tourism with visitors to www.visitsouthdevon.co.uk up more than 7% on 2015, accounting for just shy of 870,000 site visits over the past twelve months. Combined with day trips and overnight stays, Visit South Devon predicts that tourism in East Devon, Mid Devon, South Hams and Teignbridge could contribute even more than it did in 2015 when tourism in Teignbridge, Mid and East Devon brought in over £610 million to the local economy sustaining 13% of all jobs. Looking forward to the year ahead, Visit South Devon anticipates another strong year boosted by the weakness of the pound post-Brexit, the growing quality of accommodation and attractions in South Devon, and the positive impact of James Marsh’s long awaited film starring Colin Firth and Rachael Weisz, The Mercy, which was largely filmed in Teignmouth and is due out later this year. Sarah Stride, General Manager for Visit South Devon, said: “2016 has been a great twelve months for tourism in the local area and for Visit South Devon. In the early summer we launched the new South Devon app providing a host of offers and deals for visitors planning their holidays and choosing where to go whilst on holiday. With over 1/3 of visitors to South Devon choosing a last-minute break, the app, combined with the new-look Visit South Devon super-website, provides the perfect solution for visitors taking spur of the minute trips to Mid Devon, East Devon, Teignbridge and South Hams. “Later in the summer BBC Radio 1’s ‘Big Weekend’ put Powderham and Teignbridge firmly on the map as a stunningly beautiful place to visit, which we anticipate will lead to many return trips a building on the £1.7million brought in to the local tourism economy over the weekend of the event. “In the Autumn BBC1 aired the second series of The Coroner, which showcased South Hams and caused a surge in traffic to the Visit South Devon website, rising 30% on the previous year, which itself had seen a 44% lift on the first day of the first series. This helped the month of November achieve an overall 12% increase in visitor numbers month-on-month compared to 2015. Through extensive new content and enhanced SEO, Visit South Devon aims to boost visitor numbers both to the site and to tourism businesses covered by Visit South Devon, increasing the number of day visits, short breaks, longer holidays and business trips to the local area. Combined with active and engaging social media work, marketing and PR, Visit South Devon aims to bring over 1 million users to the site each year, building on its success over the past three years, which has seen a 137% growth in website traffic to its site. 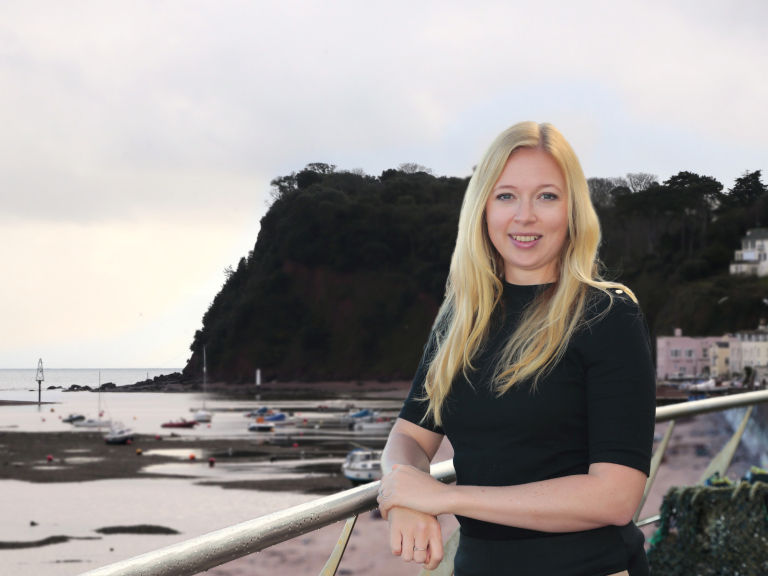 Picture shows Sarah Stride, General Manager for Visit South Devon, in Teignmouth, set against the backdrop of The Ness, Shaldon.